The nuclear pore complex (NPC) is comprised of approximately 50 unique proteins collectively known as nucleoporins. The 98 kD nucleoporin is localized to the nucleoplasmic side of the NPC. Rat studies show that the 98 kD nucleoporin functions as one of several docking site nucleoporins of transport substrates. The human gene has been shown to fuse to several genes following chromsome translocatons in acute myelogenous leukemia (AML) and T-cell acute lymphocytic leukemia (T-ALL). This gene is one of several genes located in the imprinted gene domain of 11p15.5, an important tumor-suppressor gene region. Alterations in this region have been associated with the Beckwith-Wiedemann syndrome, Wilms tumor, rhabdomyosarcoma, adrenocortical carcinoma, and lung, ovarian, and breast cancer. Signal-mediated nuclear import and export proceed through the nuclear pore complex (NPC), which is comprised of approximately 50 unique proteins collectively known as nucleoporins. The 98 kD nucleoporin is generated through a biogenesis pathway that involves synthesis and proteolytic cleavage of a 186 kD precursor protein. This cleavage results in the 98 kD nucleoporin as well as a 96 kD nucleoporin, both of which are localized to the nucleoplasmic side of the NPC. Rat studies show that the 98 kD nucleoporin functions as one of several docking site nucleoporins of transport substrates. The human gene has been shown to fuse to several genes following chromsome translocatons in acute myelogenous leukemia (AML) and T-cell acute lymphocytic leukemia (T-ALL). This gene is one of several genes located in the imprinted gene domain of 11p15.5, an important tumor-suppressor gene region. Alterations in this region have been associated with the Beckwith-Wiedemann syndrome, Wilms tumor, rhabdomyosarcoma, adrenocortical carcinoma, and lung, ovarian, and breast cancer. Alternative splicing of this gene results in several transcript variants; however, not all variants have been fully described. 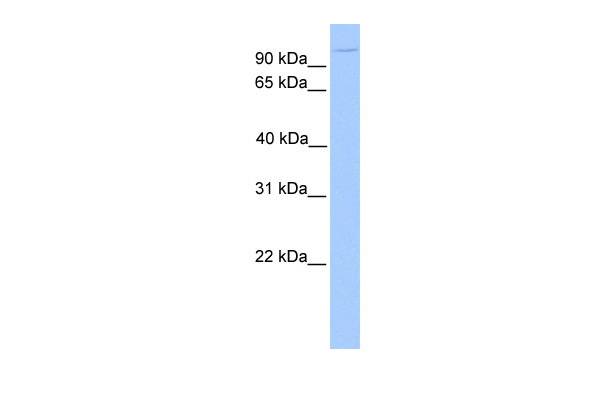 Western Blot analysis of NUP98 expression in transfected 293T cell line (H00004928-T02) by NUP98 MaxPab polyclonal antibody.Lane 1: NUP98 transfected lysate(66.66 KDa).Lane 2: Non-transfected lysate. 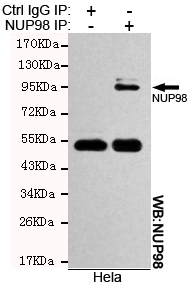 Western Blot analysis of NUP98 expression in transfected 293T cell line (H00004928-T02) by NUP98 MaxPab polyclonal antibody.Lane 1: NUP98 transfected lysate(69.80 KDa).Lane 2: Non-transfected lysate. 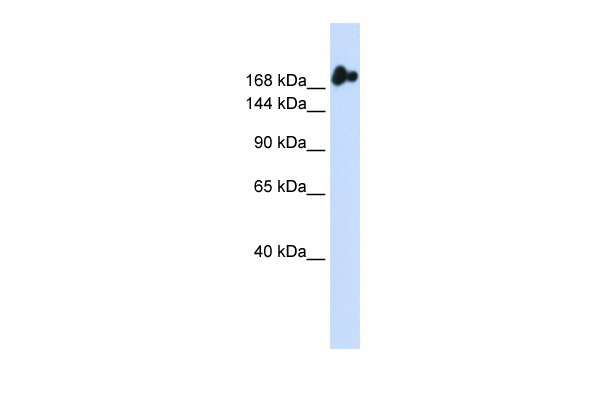 Western Blot analysis of NUP98 expression in transfected 293T cell line (H00007447-T01) by NUP98 MaxPab polyclonal antibody.Lane 1: NUP98 transfected lysate(66.77 KDa).Lane 2: Non-transfected lysate. 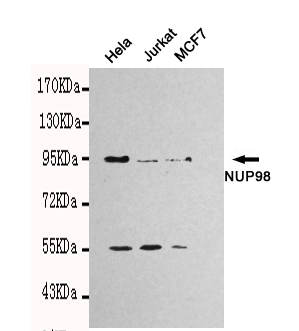 Western blot detection of NUP98 in Hela,Jurkat and MCF7 cell lysates using NUP98 mouse mAb (1:1000 diluted).Predicted band size: 98kDa.Observed band size: 98kDa. Immunoprecipitation analysis of Hela cell lysates using NUP98 mouse mAb.